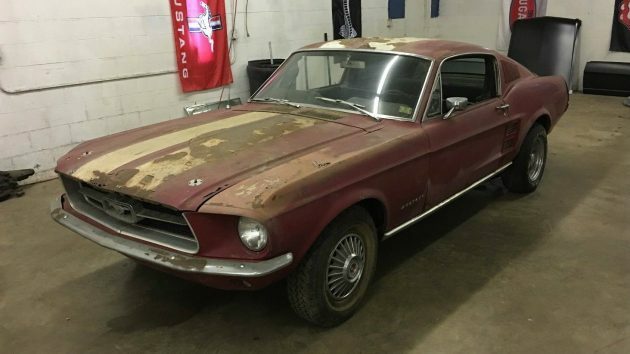 Barn Find Big Block 4-Speed Mustang! 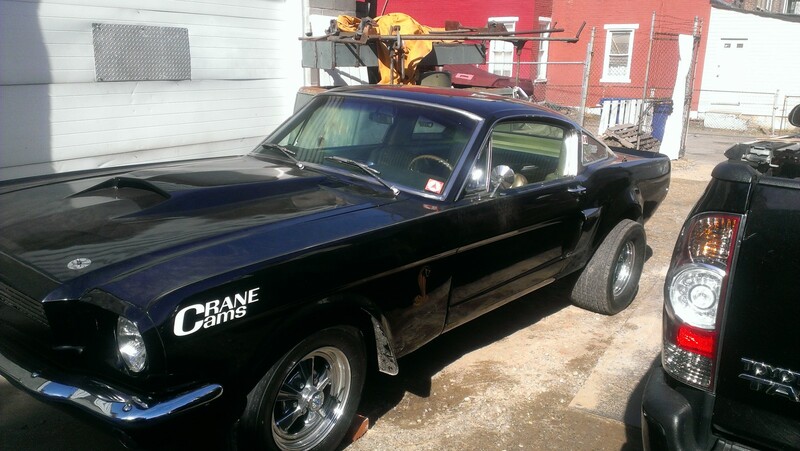 How can you go wrong with an early Mustang fastback with a factory 390 big block and a four speed? 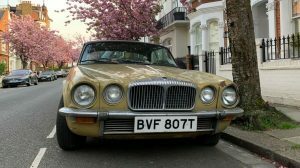 Well, if you speak to someone that’s done rust repair on one of these, they might have a different opinion, but nonetheless these cars seem to have a great deal of value. This one is being offered here on eBay at no reserve, and I’ve watched bidding rise over $10,000 while I’ve been writing this post. The auction is only for three days, so bid soon! Although pretty much everything that you could possibly need for this car is available, you’ll need to wear out your keyboard on the body alone. Not only is there the rust you can see, there’s a lot you can’t see right away. Thankfully the seller is honest about it and doesn’t try to hide it in pictures. I would like to see more underside ones, but given the car’s Pennsylvania history I’m guessing it’s seen some salt. By the way, it was pretty easy to come up with contact info for someone I think is the wife of the Mr. DeFranco shown in the documentation (owner in the early 1980s); perhaps she would have some more history on the car. It would certainly be interesting to speak with a former owner. 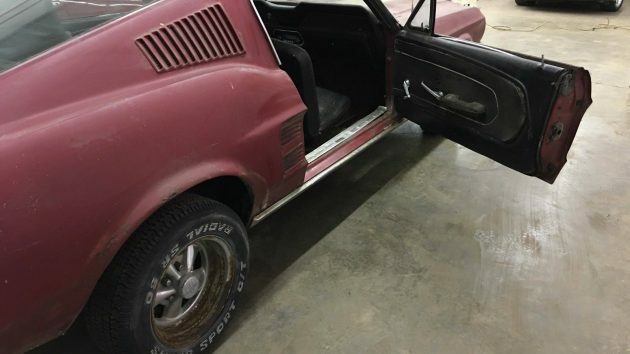 This is the door I remember on a 1967 Mustang — my parents had two while I was growing up. No fastbacks or big blocks, though! You can bet this car has been pushed a bit in it’s day. Would you go back stock, or modify it for performance? The seller tells us that the 390 will turn over. I’m surprised they haven’t started it off of a bottle if that’s the case. 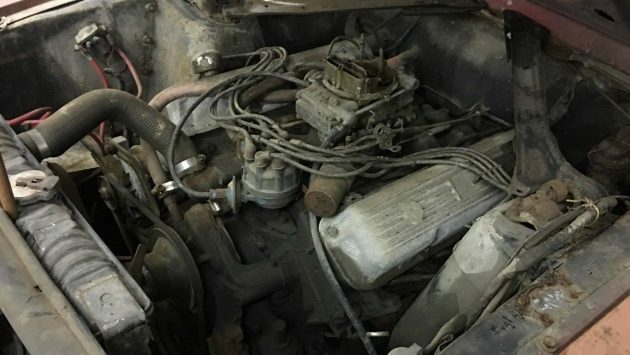 Just looking at it, I’m guessing my friend Chris that owns a big-block 1967 is correct when he tells me that changing the spark plugs isn’t fun. Is that a task you’d be willing to take on? It’s now over 15 grand. Rare car that pushes all the right buttons. Nice find Jamie. The ’69 is my favorite Mustang, and as you say it’s hard to beat the 390 and four-speed. I followed one of these at Road America for some “Parade Laps” (no passing) and it sounded great. Looks like it would be really easy to go wrong on this one. I have to talk my neighbor into listing his 69 Q code…it’s in better shape and should bring a small fortune…he’s retired and will never restore it, as he has wanted to for 20 years…very nice find, guys! On the other hand, changing the spark plugs on a 390 AMX is a breeze. By comparison so are the headers. Could you imagine changing headers on a Mustang? That makes me wonder how a Mustang draw more money than an AMX or a Javelin which are both vastly superior cars in every way. Values are rarely based on the superiority of a car or model in a proportional way that you seem to suggest. The AMX has no real reputation outside of the world of the pony car/SCCA realm. It has no Bullitt, no GT350, etc., etc. If mechanical simplicity/ease of operation were what mattered there are a TON of high dollar cars that wouldn’t be worth nearly what they are. But I think perhaps you know that and just want to inject some AMX admiration into a Mustang thread. Well Mike if the moderator had not chopped off 9/10ths of my post you probably would not think that way. I’m amazed 7 people liked my post based on most of it having being edited out of existence. All the good stuff is gone. There was lots there about why I like and dislike Mustangs since I did own a Mach I when it was new. You wouldn’t think the moderator would cut out something as important as the bucket seats backs breaking off when you reached for your wallet for instance. Or the reality that the signal lights in the back of the fake hood scoop was the best option for deaf drivers ever invented. But he did. And what about the invisible clocks? I compared the electrical systems of the two cars fairly I thought. Both abysmal for the same reason. They both shared identical components. That’s where the Found On Road Dead and the Fix Or Repair Daily monikers came from. I didn’t touch on the handling in wet or icy conditions that Mustangs were famous for. But you are right about the value of exposure and promotion. That escalates value like nothing else. But this site is about truthfulness with respect to the real attributes of the car. Or at least I thought it was until the moderator took a literary chainsaw to my previous post. The reason I wrote the post the way I did was to fairly balance the scales with respect to historic injustices. A perfect example is al8apex’s comment. In four words he was able to plumb the depths of biased thinking and make a very efficient contribution towards furthering the injustices AMC suffered back in the day that resulted in AMC’s demise and the opening of the flood gates to foreign manufacturers who have become very successful at exploiting the inadequacies of American design inequities. Inequities that AMC was single-handedly attempting to address but without the cash flow needed to pull it off successfully. Don’t get me wrong. I enjoy the full spectrum of muscle cars from every domestic manufacturer or I would not be here. I’ve had my share. But if we can’t talk honestly about our cars here, then where? The moderator whoever he was didn’t do anyone any favours. I own several of these and have restored many. Rust repair is not entirely difficult if you have the tools and knowledge base. I buy coupe’s and cut them up for their original sheet metal as it’s a fraction of the price of those repop panels and the fitment is exact. S codes are not as popular as I’d like and although it’s heresy to an extent, the sad reality is that you’d have more equity if you built an Eleanor out of it. I’m not suggesting that be done as I love originality, just providing the sad economic stats. This one is not highly optioned and they are more plentiful than most think. That being said, I wouldn’t go much over the 15k the current bid is at, you’ll spend 50k + to get it right for sure. Jim. I bought some gto sheet metal years ago in Michigan. Wonder if it was you? Not me, never owned a goat. Never gonna happen, they made way too many coupes and they are not desirable. Not many people have the ability or talent to cut them up correctly and re-attach the panels as to make it look original which is why the repop market continues to thrive. They prey on the people that will not take the time to build it correctly. Try taking a coupe and removing it’s panels to restore a FB sometime and you’ll understand why it’s rarely done. It’s a bad form to recommend random people with no connection to the car track down the wife of a previous owner to ask her “twenty questions”. It’s one thing for an owner of the car to do so, it’s another thing for someone who stumbled across an online classified ad to do so. Alright! There’s an 8-track of BTO’s Four Wheel Drive. The past owner knew what to play in this car. Looks like a great project car and the best color combination to boot! Nice car. Rebuild the drive train, do the body work and a few nice coats of highland green. Steve Mc queen bullet look. Great find!! Jim above hit it on the nose. this is a 50k resto, but a great car for sure. Wish I had it in me to take on a project this this, she deserves a complete restoration. I just picked up a Deep impact blue/black cloth interior 2014 Mustang 3.7 V6 with the 6 speed manual trans. Love the factory HID headlights and sequential rear tail lights! The V6 has 305 horsepower/280 torque and gets 19 mpg City/29 mpg Highway or 22 mpg combined. Good horsepower AND fuel economy…….the best of both worlds! The last thing we need is yet another bullet or clone. 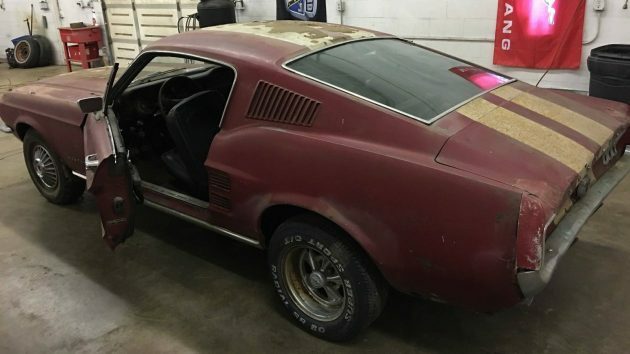 If your going to take this on, it deserves some individual personality, give it an as built restoration or a more unique restomod treatment. 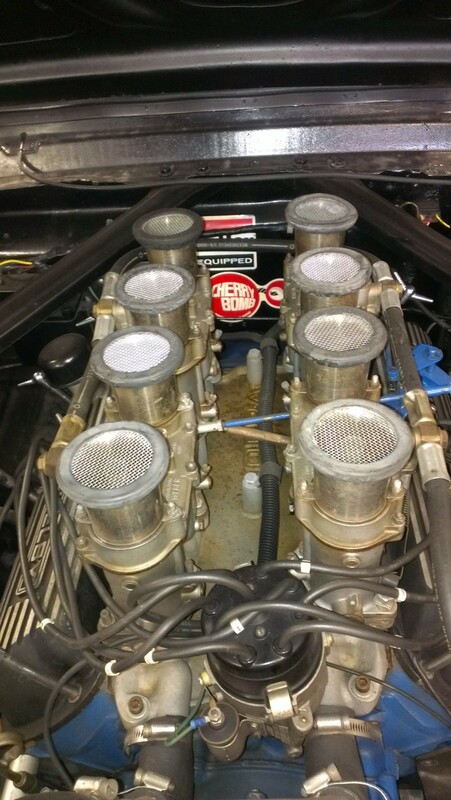 Helped a friend put a set of headers one time on an “S” code mustang….told him (shew what a job) while we had the durn engine out, might as well put a set of plugs in the durn thing….torque monster…but basically a slug…dang sure not a 428 cobra jet…. I know a couple 390 FE cars that would take exception to the slug remark as they spank most other cars in their CI range. Remember helping a friend change the plugs in one of these. Wondered how it could have been designed so poorly. Now it seems most new cars are even more challenging. Changing plugs on a FE Mustang is only a task if you run the big brake power booster. I can change the plus on my FE Mustangs in about 10 minutes but I don’t run power boosters and if you’re running one, it just means you’re not running a big enough cam to help that FE run like it should. Not an issue with an AMX either way. No matter how you slice it, when you compare the two cars on direct comparison basis I can tell you as an owner of an AMX and a Mach I when it was new, an AMX is the superior car to own. Even as Drag Racers, AMXs even with zero corporate resources and an almost complete absence of mainstream parts still remain competitive with Mustangs of any year thanks to back yard mechanics and simplicity of design. Mustangs faced with those obstacles would have suffered the same fate as the Lada thanks to the same sort of quality issues. Direct comparison to what ? Style ? Design ? Sales ? Popularity ? NHRA win stats ? Yeah, good luck with any of that. That doesn’t make sense. Why do people insist on using this teeth-grating phrase??? Repeat after me: Needs TO BE Restored. If you ever spend any time in rural Ohio or Pennsylvania you will hear “needs restored” or something similar a lot. It’s a regional thing. Kind of like “Jag-you-are” vs. “Jag-wire”. No big deal. 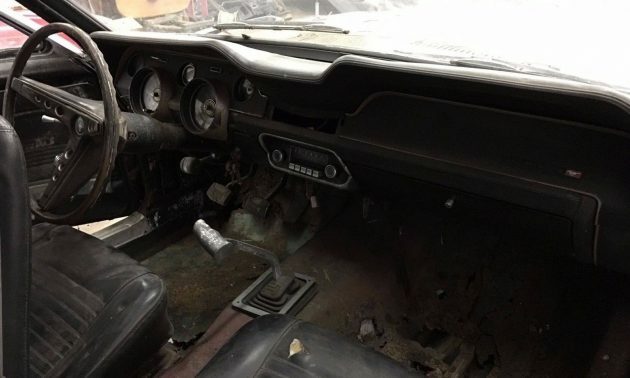 I think that’s a ’69 Mustang steering wheel. I know it’s not a ’67 with the padded horn button. I had a 67 with a 390 but it had a 3-speed and also it was too heavy for the front of that car the 390 is a heavy engine, but it ran like hell. I will say Franks pay stub is a blast from the past! Your a little light at 20k, it’s up to $25,100 with 8+ hours left in the auction. UNREAL! From experience back in the day, you can not believe how badly this car will push into a corner with that heavy 390 engine. They just don’t turn, and this really takes the fun out of spirited driving. EX Watkins Glen,Mid Ohio,289 FIA COBRA PLENUM,,Crane Cams,500hp,did a 10.89 @127.9 at Langhorne speedeway in 67,ex Bill Rea race carAll Cobra/Shelby,all Gt options,rare gold/green interior,all 1966-67 timecapsule. Wanna provide a link to the NHRA record holder stats ? What class did it run in and what were the rules ? 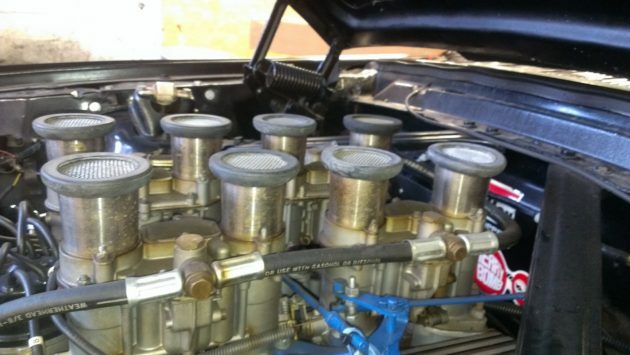 Nothing during that time was running any faster than low 12’s with a small block. July in Kenosha. No other car will ever match it. The importance of this is that anyone could buy an AMX or Javelin and do the same thing right out of the showroom. My brand new Mach I had difficulty getting out of my driveway in one piece. A 1967 Rebel won Baja in that year and Jim Rockford’s Rambler SC/Ramblers won it in 1969. All this with a racing budget completely dwarfed br the Mustang’s budget. Uh-huh, we’ll all just take your word for it. I get it now, AMC products = great big winners, Ford, GM, Mopar = not as good, big losers. Lol. Except for the fact they didn’t and were ugly as hell. Jim remember what I said about my original article being amputated by a moderator with a digital chainsaw? Again if that twerp had not obliterated 90% of the article you’d have no reason to say that. I treated the subject completely fairly. I just don’t feel like writing it all over again. My two cents. Apparently, I made a great decision buying my brand new ’67 Fairlane GTA instead of the same model Mustang as the one listed here. Because I beat (always & often) the only two new AMX and Javelin models ever to come to where I was stationed in Germany. And no, mine wasn’t “race tuned”. Pretty good choice bog. I would have done the same thing in 1967. Killer design that still looks better than most cars designed since in my opinion. You didn’t mention what motor was in your Fairlane. With anything up to a 390 in it that would have been a good handling car for the times. Better than my 65 Ford Galaxie 500XL 390 4 spd which was great in a straight line but hopeless for drifting which I did a lot of in those days. AMCs were great for drifting because the engines only weighed 600 lbs. The cars were nicely balanced front to back in any AMC. The AMXs wouldn’t have been race tuned either. Most likely they were 290 4 speeds – about the same as a Mustang with a 289. The 390 AMXs came stock with 315 horsepower and you know on a power to weight ratio, that is not muscle car territory. The cam would have been the same as that in that year’s station wagon or four door sedan. In other words no different than any other AMC engine in a given year. AMC did not have room in their factories to add any performance options. Same thing for the Rambler SC/Rambler that won everywhere – exact same engine but with the best Ram Air system on any domestic car. AMXs didn’t get a hood scoop until 1970. They were no better than the shaker hood on a Mustang because they weren’t tall enough. As I said in my original butchered post, Mustangs of any era were in my opinion beautiful cars. The 69/70 fastbacks were the automotive equivalent of baseball’s World Series winning Grand Slam. Even so the fastbacks no matter what car they were on were not seen in those days as the epitome of styling they are now because the blind spot was and is horrific. The AMX was no better. The Javelin was. Smaller C pillar. Today people are used to driving vans with worse blind spots if they don’t have windows on the sides. People forget that little detail these days because of that. Beyond that, drivers today have mirrors on both sides. John – unlike the Mustangs, the Fairlane GT and GTAs came with one engine, and one engine only…the tuned 4BBL 390. Memory says the ’66s were rated at 315 hp & 67’s at 335 hp (mine was a ’67). I haven’t looked in a while…so I could be off a bit on those numbers. The guys that I was friends with, and had friendly wagers with, had the 390 versions of their AMC cars & swore they had as much or more hp, better traction and all that “jazz” until the rubber met the road. That road being the Autobahn. Then they bought the beers at the “O” club. After getting back from my service I traded the Fairlane for a fastback Mustang. I ordered a silver with black stripe package ’71 BOSS 351. Huge sailpanel that would have been a big blind spot for most, but I’m really tall & all the mirrors worked great for me….Yes, believe I had to pay extra for a passenger side matching mirror, now that I think of it. I got my Mach I after having my 390 Galaxie for over a year. That car had a solid lifter cam under a 750 Holley. That car would do 70 mph on 1st gear. It was a blast to drive. By comparison with that car the Mach I was a stone. When I got my Rebel Machine I was shocked when I saw how small the AMC 390 was compared to my Ford 390. It wasn’t until I had the heads blue printed that I began to realize the potential of the AMC engine. Even so not being a mechanic it took years for me to fully appreciate how awesome the AMC mills were. The AMXs you raced likely had just over 280 hp.